Poland following the First partition. Etats de Pologne et de Lithuanie Divises par Palaunats et Provinces Ecclesiastiques Avec le Roiaume de Prusse et le Duche de Curlande. 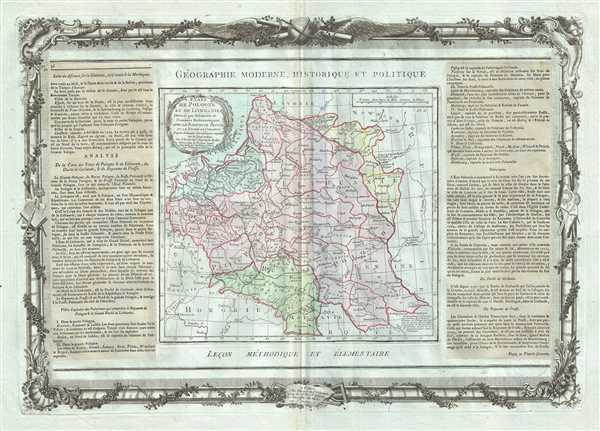 This is a fine 1786 map of Poland and Lithuania by Brion de la Tour and Louis Charles Desnos. It covers modern day Poland, Lithuania, Latvia, Belarus, Ukraine, etc. The map depicts the Polish boundaries set following the First partition of Poland. Renders the entire region in extraordinary detail offering both topographical and political information. In 1764 Stanislaw August Poniatowski was elevated by election to become King of Poland. This worldly and refined ruler attempted various reforms intended to preserve the failing Polish state, but found himself increasingly subservient to Tsarina Catherina II of Russia. The Bar Confederation of 1768, a rebellion against increasingly Russian influence over Polish politics, led to the First Partition of the Commonwealth, a permanent annexation of Polish territory by its more powerful neighbors. Subsequent partitions in 1793 and 1795, would eventually lead to the disintegration of the Polish state, though it was later reconstituted during the Napoleonic Wars. A beautifully engraved title cartouche adorns the top left quadrant of the map. To the left and right of the map are paste downs of French text with remarks and description of the map. Surrounding the whole is an elaborate decorative border featuring floral arrangements, surveying tools, elaborate baroque scalloping, and a winged globe. This map was issued as plate no. 36 in the most deluxe edition of Desnos’ 1786 Atlas General Methodique et Elementaire, Pour l’Etude de la Geographie et de l’Histoire Moderne. Louis Charles Desnos (1725 - April 18, 1805) was an important 18th century instrument maker, cartographer and globe maker based in Paris, France. Desnos was born in Pont-Sainte-Maxence, Oise, France, the son of a cloth merchant. From April of 1745 he apprenticed at a metal foundry. Desnos married the widow of Nicolas Hardy, sone of the map, globe, and instrument seller Jacques Hardy. Desnos held the coveted position of Royal Globemaker to the King of Denmark, Christian VII, for which he received a stipend of 500 Livres annually. In return Desnos sent the King roughly 200 Livres worth of maps, books and atlases each year. As a publisher, Desnos produced a substantial corpus of work and is often associated with Zannoni and Louis Brion de la Tour (1756-1823). Despite or perhaps because of the sheer quantity of maps Desnos published he acquired a poor reputation among serious cartographic experts, who considered him undiscerning and unscrupulous regarding what he would and would not publish. Desnos consequently had a long history of legal battles with other Parisian cartographers and publishers of the period. It is said that he published everything set before him without regard to accuracy, veracity, or copyright law. Desnos maintained offices on Rue St. Jacques, Paris. Desnos, Louis-Charles, Atlas General Methodique et Elementaire, Pour l’Etude de la Geographie et de l’Histoire Moderne, 1786. The Atlas general, civil, ecclesiastique et militaire, methodique et elementaire was issued by Louis Brion de la Tour (1756-1823) and Louis Charles Desnos (1725-1805) from about 1764 with subsequent reissued until about 1790. It was intended for use by the 'young nobles of the Ecole Royale Militaire,' but also proved popular with general audiences. The atlas was compiled using an uncommon printing method involving multiple pressings as well as paste downs for each page. Typically maps from the atlas feature an elaborate rococo decorative border containing a smaller map of approximately 10 x 14 inches, a title at the top and bottom of each page, and descriptive text, generally either a pastedown or separate printing to either side of the map. This unusual combination of printings and pastedowns allowed the publisher maximum flexibility and thus it is not uncommon to find variants of this atlas both with and without the decorative borer, with and without the descriptive pastedowns, pastedowns in different languages, and with changing titles for individual maps. There are various different collations for this atlas depending upon where it was intended to be sold. For example, versions sold in the United States and England replace the large map of France with new maps of the United States. It was not uncommonly bound with de la Tour's Atlas National de France. Very good. Minor toning along original centerfold. Minor spotting at places. Original platemark visible. Minor overall toning.